A familiar face sitting courtside advising the national team and most recently qualified as an ITTF Course Conductor, Thailand’s Korakij Sermkijseree has not let the grass grow under his feet, always known as Kit; recently he conducted his fifth ITTF/PTT Level One Course. Bangkok was the home from Monday 18th to Friday 22nd June. Furthermore, it was a very elite group that attended the five day itinerary. 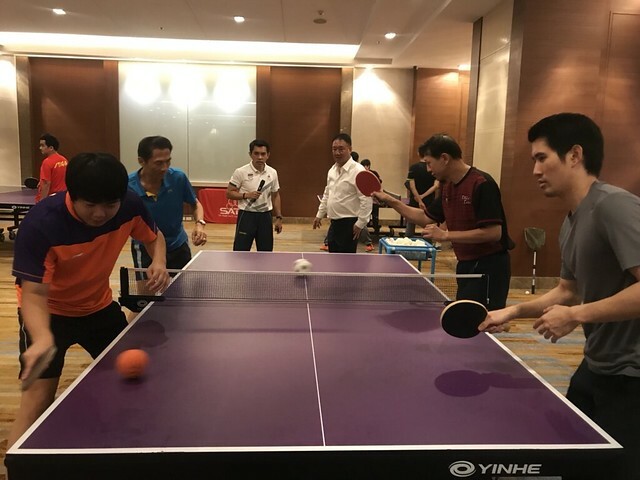 It was a most well-informed as well as most enthusiastic class, one that demonstrated the increasing respect for Korakij Sermkijseree as an ever greater authority on the sport and one that also underlined the thirst for knowledge in what is a very healthy current climate for table tennis in Thailand. Currently in Thailand where there are 77 provinces; many children want to play table tennis. There is high demand. Thus it is important to for teachers and coaches to be able to help young players gain sound basics as they make their initial steps in the sport. Undoubtedly, it is an increasingly healthy situation for the sport of table tennis in the country; most certainly Korakij Sermkijseree is playing a pivotal role, his efforts are to admired, he is setting a fine example. No doubt his sixth course will soon follow.